Of the four elements of the FISH! Philosophy, I saved this topic to write about last – make their day. The reason is because it took me the most amount of time to truly wrap my head around the concept in terms of applying it to my everyday work life. As part of my personality, I tend to help others and take time to create a positive work environment. The concept of making their day, however, can come very close to working against a leader if they overdo it with the need for affiliation with coworkers (McClelland’s Need Theory). What I have found is that there is a happy medium. Below are the things I try to do for those around me. These are not necessary over-the-top actions, but I find that it is often the smallest actions that have the greatest impact. Take time to say hello to everyone in the morning and stop to ask how they are doing. Reference an earlier conversation on an important subject to them. Offer to help with tasks that are not my normal responsibilities. Ask follow-up questions when someone is obviously having a noticeably good or bad day. Noticing something new or different, such as a haircut. Share positive feedback with them in front of the team. What I have found is that making someone’s day has to be part of who and what you are. People have to understand that you are doing something nice with no expectation of a return. When that is not the case, people question the motives and usually will not accept the action as intended. For many years I considered myself a “nice guy,” but that didn’t really evoke the right feeling. I now like to describe myself as a good person. That is what allows me to show kindness and make people’s day because they trust who I am and what I am about. There are wonderful payoffs when making someone’s day. While that is not the objective, it can certainly be an outcome. Last November, I was walking to class and stopped to help a student who was having trouble carrying some boxes. We were headed in the same direction and struck up a conversation. It ended up that she was an intern in the office I was applying for a job (my current position). While she was not in a position to help get me the job, it was a coincidence that helped buy me credibility before I even started. You never know who or what is around the corner, so it is always a good idea to be kind and choose to make their day. 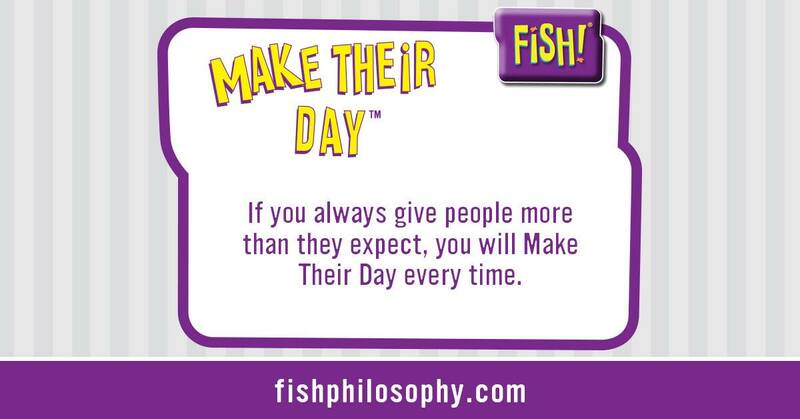 What is the best example from your own professional career of someone making your day? Please share in a comment below. Welcome to my blog! I share what I have learned in the classroom, from my career as a consultant and my personal experiences to stimulate ideas, spark conversations and perpetuate lifelong learning.